Luz Dary Gelpud Rojas checks the health of flowering potato fields. The potato is one of Colombia's most important staple foods and a significant source of low-cost calories for families. However, yellow potato varieties grown in southern Colombia’s Nariño region are low-yielding and highly susceptible to late blight disease. As most families in this region own small farms, planting high-yielding, disease-resistant potato varieties is vital to ensure a large enough harvest for both consumption and sale. To address these challenges, farmers, breeders, and scientists collaborated on the development and selection of three new varieties of yellow potatoes that have a higher nutritional content, increased resistance to late blight disease, and higher yields. 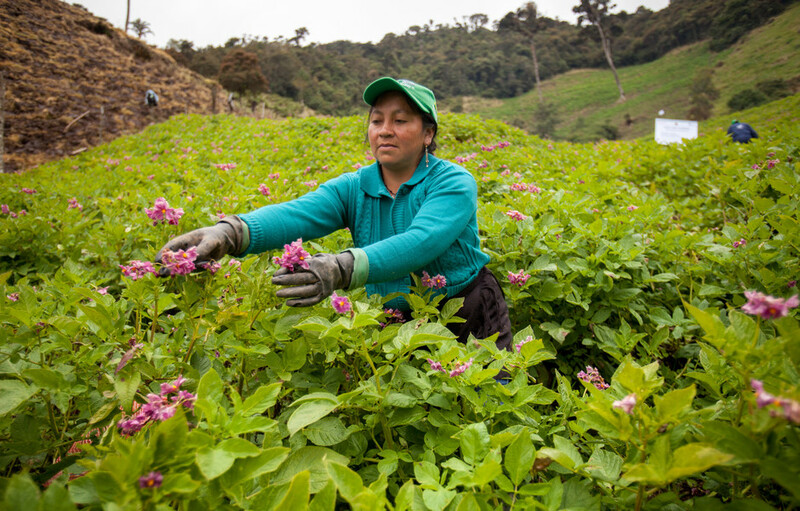 Once these new varieties were developed, the next step involved working with farmers of all sizes to make them available to millions of Colombian consumers and alleviate malnutrition and food security, particularly for rural families. Farmers, breeders, and scientists married scientific knowledge and traditional practices to develop three new yellow potato varieties: Criolla Ocarina, Criolla Sua Pa, and Criolla Dorada. These potatoes yield 15% more than traditional varieties, are twice as resistant to late blight disease, contain double the amount of protein, and have nearly 20% more iron and zinc. A sustainable seed supply system was developed without requiring external subsidies. The business model enabled seven groups of rural entrepreneurs to become specialists in the production of high-quality seeds to be sold to potato growers. Short market chains ensure local seed producers can meet local needs while preventing the movement of pests and diseases from one location to another. The project’s partnership with Agroidea, a private seed plant breeding and production company, accelerated the scale-up by producing elite and super elite potato seeds of the new varieties and selling directly to large, small, and medium-sized potato producers. New community groups called Shagras para la vida (“Home gardens for life”) have recovered indigenous knowledge (e.g., more organic agriculture) and have increased incomes. This intergenerational community-based approach resulted in more fruits and vegetables being grown in new communal gardens and traditional family gardens, increased dietary diversity, and the recovery of native plants. In total, 160 families learned how to produce healthy, indigenous crops through the shagras. Overall, 70% of participating households were able to improve their nutrition and health. The project assisted in the implementation of a nationwide program to supply micronutrient powders to mothers and schools. These fortified “sprinkles” can be added to a young child’s food once every two days, providing most of the micronutrients they need. A clinical study involving 2,589 children under five showed that children with mild or moderate anemia at the beginning of the study in 2016 had no anemia when tested in 2017. The project reached an agreement with the National Fund for the Promotion of Potato Cultivation to continue scaling up rural entrepreneur networks at the national level. The team at the National University of Colombia is documenting the models and promoting them within the ministry of agriculture and rural development for possible inclusion in a national rural development policy. The Canadian International Food Security Research Fund is jointly funded by Global Affairs Canada and the International Development Research Centre.